Please enter your details below and we’ll keep you up to date with any news and events. READY WHEN YOU ARE TO FILL AND SERVE! Look at our chef\'s corner for inspiration! Our BAKED EARTH® flatbreads have been created for chefs, to enhance menus with a practical and versatile bread product that can be prepared and served in a wide variety of ways. 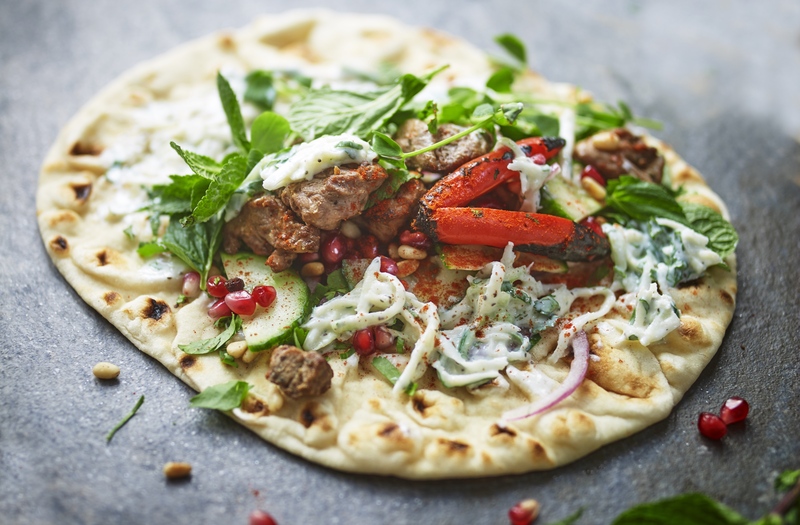 A key insight we found in this sector is that chefs want a flatbread that can be heated at the same time as fillings and toppings, so our flatbreads are designed to do just that. We enrich the dough to ensure a soft textured flatbread that can be used as a base for a world of flavours. Top them, fill them, serve as a panini, cut and serve as canapés…the possibilities are as wide as your imagination! Recreate an authentic street food experience with our new BAKED EARTH® sourdough flats. Golden and bubbly, with a soft, open texture, they’re perfect to roll and fold, and simple to assemble – just heat, fill, wrap and serve. Flexible, but robust enough to take a variety of fillings, our sourdough flats take hand-held street food to a premium offer. No raising agents ensures a more natural, deliciously moreish taste, and our vegan-friendly, sourdough recipe makes them bang on trend and suitable for everyone. How will you use it? Topped, rolled, wrapped…the possibilities are as wide as your imagination! Our BAKED EARTH® flatbreads are the perfect base for a whole range of exciting and profitable dishes. They add value and interest to menus, and are simple to prepare and attractive to serve. Flatbreads are a staple of many cuisines, so you can offer your customers a world of flavours by using different topping ingredients, as simple or extravagant as you wish. Top them and serve whole, or cut and serve as canapés…the possibilities are as wide as your imagination! 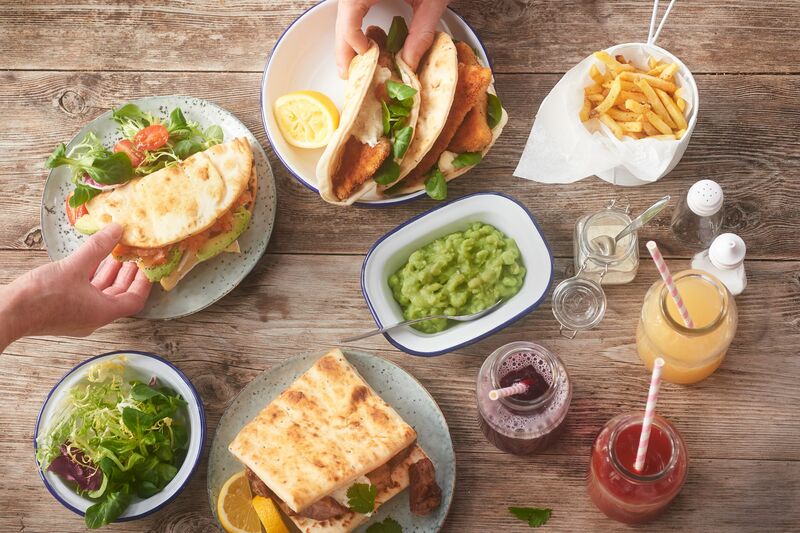 Our BAKED EARTH® folded flatbreads are a great alternative bread carrier that look great, taste great and add value and interest to menus. They’re easy to prepare and attractive to serve – anything you can put into a sandwich, baguette or a wrap will be great in a folded flatbread. Because flatbreads are a staple of many cuisines, you can offer your customers a world of flavours by using different filling ingredients. Our folded flatbreads are especially great for hot fillings, and to make preparation easier, they can be heated at the same time as their fillings. The possibilities are as wide as your imagination! David is passionate about supplying products that offer real solutions for our foodservice customers and help them to add value to their menus. Get him started about how versatile our flatbreads are and his enthusiasm is infectious! BAKED EARTH® flatbreads make great toasties. Fill with pulled chicken, barbecue sauce, mature Cheddar, fresh green chilli and beetroot hummus. Toast for 5 minutes in a panini grill, or 5-6 minutes in oven, until piping hot. A tasty and profitable light lunch menu item, served with a green salad. Top the flatbread with flaked tuna, red onion, red kidney beans, black olives and cherry tomatoes. Drizzle with a little oil, season and garnish with flat parsley. Simple to put together, but impressive to serve and delicious to eat! Top a BAKED EARTH® flatbread with a selection of salumi and antipasti, olives and shaved parmesan. Warm in the oven until piping hot. Spread the flatbread with passata or red pesto and scatter with roasted veg pieces (we’ve used courgettes, red onion, tomatoes and peppers). Top with goats cheese and garnish with rocket. A generously filled, Middle Eastern style warm BAKED EARTH® flatbread that makes a substantial menu item. Harissa marinated lamb cooked with onion and garlic, peppers, pomegranate and giant butter beans. Add some theatre with a falafel skewer, warm in the oven until piping hot and serve with minted yogurt. BAKED EARTH® flatbreads offer a quicker way to create canapés, and a better texture than a standard crouton. Choose your toppings to suit occasion and budget. Here we’ve used chicken tikka, cherry tomatoes, chilli hummus and mature Cheddar, finished with green chilli and fresh coriander. Just assemble, warm in the oven until piping hot then cut into individual canapés. BAKED EARTH® folded flatbreads make an authentic carrier for a world of dishes, like this. Grill skewers of lamb marinated in oil, lemon and dried oregano. Stuff into flatbreads and drizzle with tzatziki and chopped mint.